2019 is kicking into gear with the stock markets starting to rise again. And Magic isn’t any different as we continue on with Ravnica Allegiance spoilers and many people playing a lot more MTG Arena. 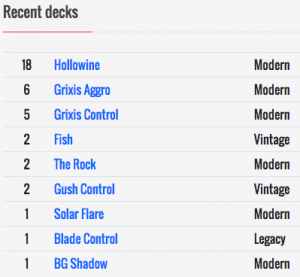 The interest in Modern is still very strong and will continue to grow especially since Grand Prix Oakland and SCG Columbus just passed. And looking forward, we have SCG Worcester from January 12-13 and Magic Fest Toronto from February 8-10. Then we have Mythic Championship Cleveland from February 22-24 to showcase Standard. So there are definitely a lot of cards to talk about. 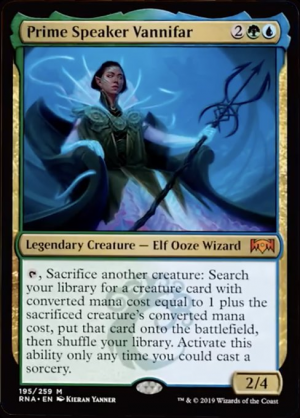 Ravnica Allegiance is starting to bring us some more Wizards, and a few of them are looking very powerful for constructed formats including Modern with Deputy of Detention most likely leading the pack. I think there’s a possibility that we could also see a Wizards deck in Standard, so keep your eye out for initial decklists as more spoilers are released. It sees a decent amount of play in Mono Blue right now, but I don’t know how much longer that will last since the manabase options will allow for some very powerful decks coming up. And it only really sees play in Izzet Wizards in Modern, but that could change very soon if we continue to see some more powerful Wizards in Ravnica Allegiance and upcoming sets. People have started to brew with this and Prime Speaker Vannifar. At quick glance…this seems pretty gimmicky to me, so I would sell into the hype. There are only two printings with the most recent one being 8th Edition, so a reprint in the near future wouldn’t surprise me. People are getting excited about Orzhov in Standard with cards like Pitiless Pontiff and Seraph of the Scales. We still have a lot of cards left to be spoiled with some amount of them containing the Afterlife mechanic. But I highly doubt that this card will ever see play outside of Standard. And it sees very little play in EDH/Commander, so I would lock in your value now. A lot of people have been talking about how hot Box Toppers are and will continue to be. I even mentioned a few in article #24. Here’s another one I think is an all-star. It shows up quite often in Eldrazi and various Dark Depths decks in Legacy. 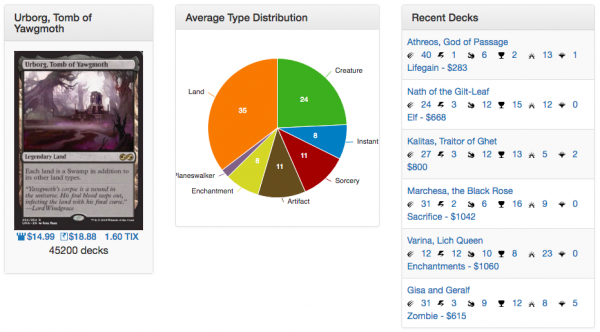 But this sees a tremendous amount of play in EDH/Commander in over 45,000 decks. Wow! The new, unique are on this card is amazing too. I think this could be an underpriced Box Topper. It sees a good amount of play in Modern. And it just won SCG Columbus. It doesn’t see that much play in EDH/Commander though. And it’s legendary, so you will most likely never need a playset. These are the reasons why I think it’s still so cheap. Plus, Tasigur lost his banana in this version. Sad. However, a lot of people really like how the Box Toppers look, so this will probably be the coolest version for a long time. This has recently started to pop up a little bit in Modern’s Golgari Midrange. 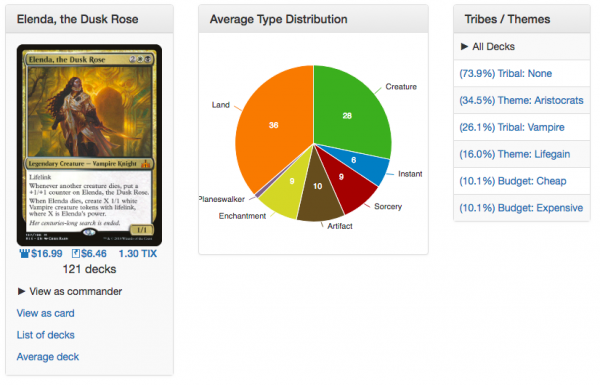 It looks like people have this and Damnation in the sideboard as options to combat different creatures they might face. Languish is really nice if you can kill all of your opponent’s creatures and leave your Tarmogoyf around. I wouldn’t go too deep on these though since it doesn’t see a huge amount of play outside of Golgari decks. And it only shows up in just over 3,000 decks in EDH/Commander. And although it’s an extended art version, it doesn’t have different artwork than the original printing. This has pretty much come back down to its all-time low now that it’s rotated out of Standard. 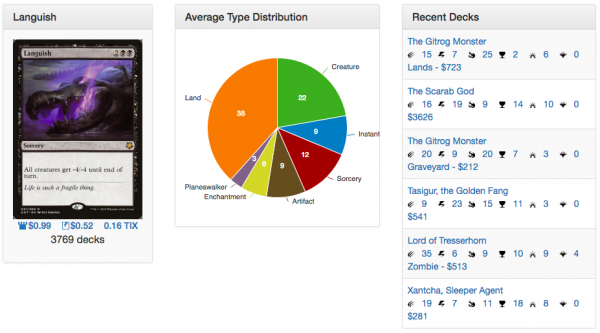 But this has really started to see a lot more play owing to Spirits in Modern which also just won SCG Columbus. Although the fastlands from Scars of Mirrodin have skyrocketed over the years, I would be careful with the ones from Kaladesh because so much of the set was opened owing to the Inventions. 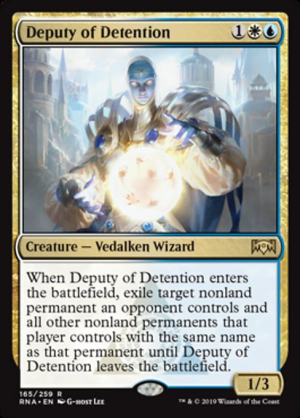 However, I doubt this will fall any lower especially with Deputy of Detention joining the mix pretty soon as another nice option for Bant Spirits or some type of new Azorius or Bant Wizards deck. Nice. I don’t think they’ll see a large spike since a ton of Dominaria was opened. But I think it’s a card that could start to see more play as more Wizards over the years, causing it to slowly rise in price. I’m not sure if Deputy of Detention, Lavinia, Azorious Renegade, and Senate Guildmage are enough to push the needle for Wizard’s Retort yet.